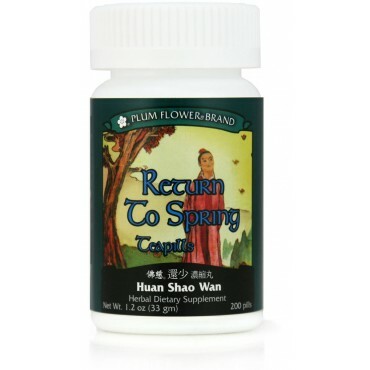 Chronic rheumatism, poor memory, hearing loss, poor appetite, weight loss, adrenal fatigue, sexual dysfunction and urinary frequency, recognized in China for benefiting the elderly are some of the imbalances satisfied clients have used this product for. Zizyphus jujube fruit, Rehmannia glutinosa root-prep, Lycium barbarum fruit, Dioscorea hypoglauca rhizome, Poria cocos fungus, Cynomorium songaricum herb, Foeniculum vulgare fruit, Morinda officinalis root, Eucommia ulmoides bark, Achyranthes bidentata root, Schizandra chinensis fruit, Cornus officinalis fruit, Broussonetia papyrifera fruit. - Da zao, Shu di huang, Gou qi zi, Bi xie, Fu ling, Suo yang, Xiao hui xiang, Ba ji tian, Du zhong, Huai niu xi, Wu wei zi, Shan zhu yu, Chu shi zi. Contraindicated during pregnancy. Contraindicated during the early stages of acute illness such as cold and flu, or during an acute infection. Contraindicated for complaints due to heat.